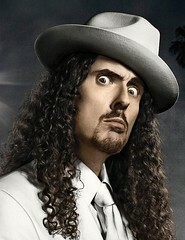 Weird Al Yankovic thinks that Straight Outta Lynwood is the best album he's made. Of course, he says that every time he makes a new one. Yankovic tries to raise the bar with every album that he puts out. This one makes it easy to see that his hard work has paid off. The cover of Straight Outta Lynwood was planned long before the first single was chosen to be on the album, but the two are pure chemistry together. "White & Nerdy" is a parody of Chamillionaire's "Ridin'," and it is sure to become the hip-hop anthem of geeks everywhere. The protagonist wants to hang out with the gangstas, but he's too white and nerdy to fit in, as he displays in the typical hip-hop style of pimping one's skills and abilities. The lyrics are classic Weird Al, but delivered in a believable hip-hop style, and enhanced through a hilarious music video. It almost doesn't seem like the same guy who gained national attention by performing a parody of Queen's "Another One Bites the Dust" on the accordion. [ADBLOCKHERE]Yankovic says that he's toned down the comedic use of instruments over the years and only includes the accordion and other atypical instruments when they are appropriate in the song. For example, the Beach Boys-inspired ode to a body part, "Pancreas," includes a ukulele because Brian Wilson used the ukulele in some of his music. Not that anyone would notice its presence along with lyrics such as, "Don't you know you got to flow, flow, flow, pancreatic, juice / Flow, flow, into the duodenum…"
Yankovic doesn't like to wear his politics on his sleeve, but he says that listeners are going to get an idea of where he stands on some issues, although as with the message of "Don't Download This Song" (available as a free download prior to the release of the CD), sometimes it's still ambiguous. The song "Canadian Idiot" is both a creative parody of Green Day's "American Idiot" and also a comedic look in the mind of the American idiot described by the Green Day song. The original proclaims a resistance to the sheep-like thinking of some Americans who are so wrapped up in their lives that they don't pay attention to the world outside. Yankovic turns this around and gives the stereotypical American perspective on Canada and Canadians. "They all live on donuts and moose meat, and they leave the house without packing heat," he sings. In "I'll Sue Ya," Yankovic has taken on the style of Rage Against the Machine to make a comment about our excessively litigious society: "I sued Starbucks 'cause I spilled a frappuchino in my lap, and brr, it was cold!" The rest of the song lists similar ridiculous suit items based on the stupidity of the plaintiff. It pokes fun at the tendency to sue over anything that someone finds disagreeable without taking any personal responsibility. After "I'll Sue Ya," the album takes a left turn and departs from anything remotely serious to complete and utter silliness that starts with the traditional polka medley of choruses from recent hit songs. "Polkarama!" begins with "The Chicken Dance" and meanders through songs from The Black Eyed Peas, Weezer, Pussycat Dolls, and 50 Cent, just to name a few. The grand finale is a perfect polka rendition of the chorus of "Gold Digger" by Kanye West, and it alone is worth the price of the CD. "Virus Alert" warns the listener of a computer virus so evil that it will "set your clocks back an hour and start hogging the shower." The tune has the pastiche of a Sparks song, but it's not a parody, much like "I'll Sue Ya" and "Pancreas." Yankovic has a knack for pulling out the essence of a particular genre or band and creating something just like it with a bit of a twist. "Confessions Part III" (a parody of Usher's "Confessions Part II") and "Do I Creep You Out" (a parody of Taylor Hicks' "Do I Make You Proud") don't do much for me. They're spot-on musically and produced very well, but the content doesn't tickle my funny bone in the way most of the other songs on Straight Outta Lynwood do. The second-to-last song on the album is a nearly 11 minute-long parody of "Trapped in the Closet" by R. Kelly. "Trapped in the Drive-Thru" details the minutia of a couple deciding on and then executing a trip to a burger joint drive-thru for dinner. According to the Rolling Stone, Yankovic figured he couldn't make the song more convoluted than the original, so he went for the most banal thing he could think of at the time. It works, but due to the length, it's a chore to listen to more than a few times. Eventually the joke wears thin and it remains only as a testament to his ability to write an eleven minute song about nothing. I already wrote my thoughts on "Don't Download This Song," which is tucked away at the end of the album. It's still quite entertaining, but having listened to it so many times already, I am glad it's at the end so I don't have to skip it when listening to the rest of the album. It's still a good song, but I need a break from it. Straight Outta Lynwood is packaged as a dual disc. One side of the disc is the CD and the other side is formatted as a DVD. It contains animated videos of six songs from the album, including the video of "Don't Download This Song" which can still be seen on the website, as well as a behind-the-scenes featurette on the making of the album. The DVD side also includes enhanced stereo and surround sound options, as well as a karaoke mix with on-screen lyrics options so you can impress your friends with your Weird Al karaoke skills. The album also comes with a full-color eighteen page booklet with lyrics and production notes. Yankovic says that creating a spiffy package is his way of combating illegal file sharing. Those who choose to get his music that way might have the songs, but they don't get all the extras without buying the official copy. He certainly makes it worth every penny. From the songwriting to the production, Straight Outta Lynwood is a must-buy.